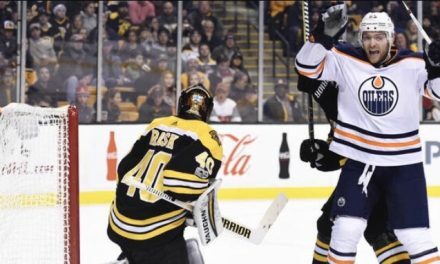 There were hits, glass shattering, and highlight reel goals last night at the Garden as the Boston Bruins hosted the Edmonton Oilers. And that wasn’t even the story of the day leading up to the game. Some fans in Bruins nation scratched their heads as Ryan Donato was listed as a healthy scratch, while newbie (to the team) Joakim Nordstrom was bumped up to the second line. Was the move going to pan out? Safe to say, Coach Bruce Cassidy knows what he’s doing. Like most young players, the shuffling would serve as a good way to re-assess what the team needs for Donato to work on. For the young winger, it would mean a chance to watch the game and gain a better perspective on his own skills. And having someone fast as Nordstrom would add that important element needed in the Krejci line. In the first opening period at 3:43, McDavid would score putting Edmonton first on the board. The Bruins drew a powerplay that led to a beautiful and nasty Pastrnak goal that tied the game at 1-1. Boston would extend their lead when Brad Marchand netted a wrist shot at 14:37. About 37 seconds later, Nordstrom would score his first goal as a Bruin, cushioning the lead 3-1 by the end of the first. The second period saw some rough hits courtesy of the Black and Gold. 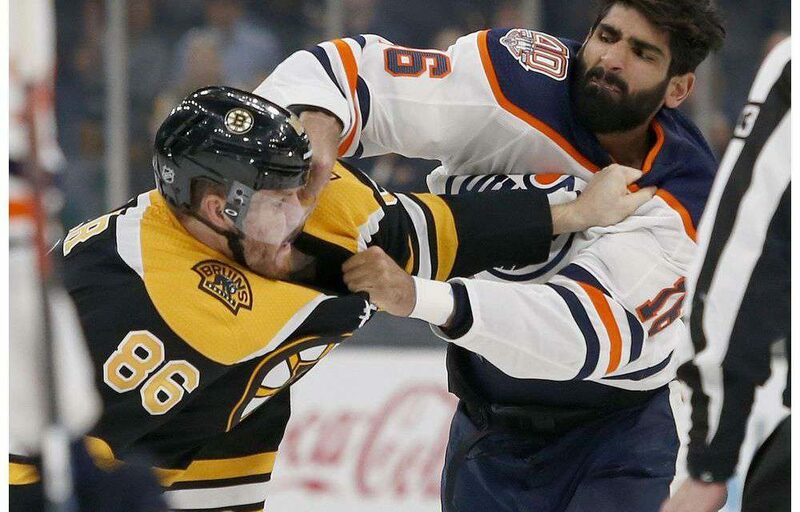 Bruins Defenseman Kevin Miller threw gloves down and fought Oilers left wing Jujhar Khaira. Center Sean Kuraly had a huge hit about 10 minutes into the second, sending Oilers Matt Benning over the boards, shattering the entire glass. Edmonton did try to rally back when Ryan Nugent-Hopkins tried to squeak one in at 7:42 but Halak made the save with Zdeno Chara clearing the puck. With 35 seconds left in the third, Patrice Bergeron would score an empty-net goal, making the final score 4-1. Bruins Goaltender Jaroslav Halak made 25 saves while Oilers goaltender Cam Talbot made 28 saves. 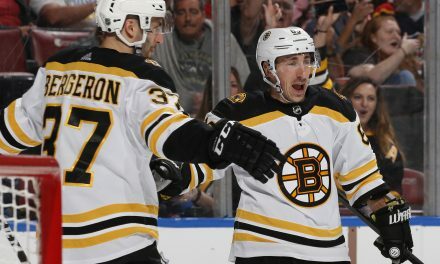 The power trio of Pastrnak, Marchand, and Bergeron all scored one goal last night along with Joakim Nordstrom. Matt Grzelcyk tallied up two assists for the night. Oilers Conor McDavid scored the only goal of the night for his team. The Bruins had 32 shots on goal while the Oilers had 26 shots. The win over Edmonton extends Boston’s winning streak to three games.